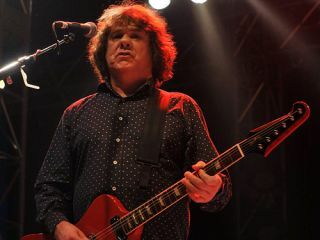 I saw Gary Moore in concert on many occasions and the highlight of the show for me was Parisienne Walkways. At one point in the song he plays a note and sustains it for an incredibly long time - so long, in fact, that the audience would often spontaneously burst into applause! The thing is, whenever I try to play it, the sustain dies away almost immediately even if I have the gain on my amp up really high. Do you know if Gary used an effects pedal to help him sustain the note or if there was any other device involved? We interviewed Gary on a number of occasions and he told us that when he sound-checked he would find the 'sweet' spot on stage where he could guarantee feedback on that particular note (a second string bend at the 15th fret from D to E). He'd then mark it with tape or chalk so when he played Parisienne Walkways and reached that point in the song he would merely move to that spot and go for it. It's worth remembering that Gary's onstage volume was always set very high - classically he would use Marshall amps plus a Guv'nor pedal, Tube Screamer, Boss distortion or something similar to drive the amp even harder. Ironically we're sure that he spent a lot of time actually fighting off the feedback when he played!